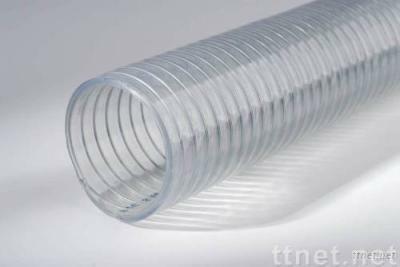 Reinforced by high-elasticity and high-strength steel wire; The pipe is clear and transparent, and of good flexibility and small bending radius. High-negative pressure resistant, weatherproof, corrosion resistant, nontoxic, long service life. Widely used in the fields of agricultural pump machinery, oil depot, petrochemical equipment, industry, mining engineering, health industry, foodstuff manufacturing, etc. For the suction & discharge of liquid, air, oil, and powder. Suitable working temperature range from -5 to +65 centigrade.